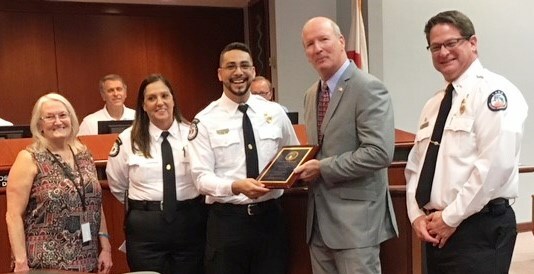 Marco Gallardo, Telecommunicator I, received the True North Award at the Lake EMS Board meeting on 13 February 2018. Mr. Gallardo went above and beyond what his normal job duties require of him on two separate occasions. Our mission at Lake EMS is to serve our communities by providing exceptional patient care and extraordinary customer service through compassion, knowledge, clinical sophistication and the integrity of our organization. Mr. Gallardo embodies the Lake EMS mission completely, and that is why he is received the True North Award.